Brian Walker is the chief advisor of retail business fitness in Australia. As Founder and CEO of Retail Doctor Group, which he established in 2005, Brian has steered his business to become the leading retail operations consulting firm specialising in multi channel retail, franchise and service sectors in every retail category. Brian is a leading media commentator on retail issues, regularly appearing on ABC, Channel 9 News and A Current Affair and Channel 7 Today Tonight. 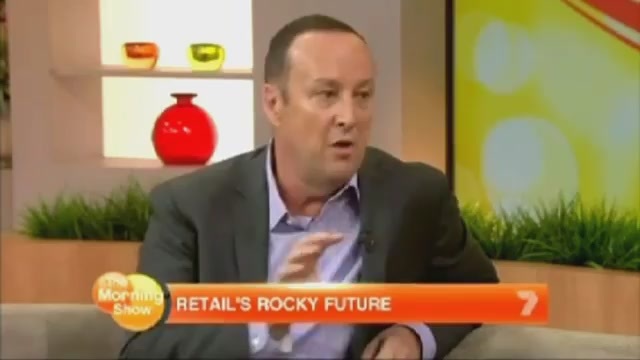 Drawing on his 20 years of experience in retail senior management with leading retailers such as The Athletes Foot, Optus, Angus & Coote, Westfield, KFC and Woolworths, Brian has become Australia's most sought after headline speaker on all aspects of retail. Generously sharing his proprietary "business fitness" consulting tools, Brian's speaking topics are original, engaging, motivational and educational. Brian is a featured columnist for Inside Retailing and Smart Company and the contributing author of on-going articles for publications such as BRW, Australian Business Solutions, RetailBiz, Tech Trader, Sydney Morning Herald and My Business. His first retail book focusing on the implementation of 'Fit Retail' is currently in production. Brian has been awarded the International Retail Leadership Award: Asian Retail Congress and won the Australian Institute of Management's National Scholarship. He was nominated for the Business Leadership Award: CPA Awards, Entrepreneur of the Year Award: Ernst & Young and Telstra Business Awards. Australian Retail Association, Australian Centre for Retail Studies. The steps to business fitness is an information rich presentation that covers the key aspects of retail business fitness looking at all the interlinking aspects of retail and beginning to engage with these concepts. This presentation aims to inspire, educate and motivate attendees across all the various aspects that build sales in a retail business. In this session Brian Walker would cover the following areas of business fitness. Brand Aid - Developing and communicating a point of difference in the market. Fiscal Physical - Understanding the numbers, P&L, stock turns, cash flow, gross profit etc. This presentation would be tailored to fit your audience and purpose to ensure the presentation will leave your customers with at least 5 key take aways they can implement in their store. The steps to business fitness is our most popular presentation due to its highly practical nature and relevance at all levels of seniority in a retail business. Drawing on global and local research, insights and best practice examples, this presentation will give retailers valuable implementation solutions for their business. Brian Walker will discuss the global trends that are predicted to land on Australian shores and practical tips on how Australian retailers can understand and respond to these trends to keep up with the rapid speed of change. We will tailor case studies within this presentation to suit your audience and will include relevant research and trends to your industry. Cross channel is now. By integrating all channels to market, retailers can grow market share, increase profits and gain customer loyalty. The point of sale is ubiquitous. Its no longer about bringing the customer to the point of sale, rather, we need to bring the point of sale to the customer. The neo consumer is here. We need to understand their personalities and wishes to be able to reach them effectively. Heighten the experience. We need to design retail destinations that meet the fundamental human needs to interact, socialise, engage and be inspired. Opening your conference with a 'State of the nation' report is a great way to set the scene and begin to engage with your audience. This session will include a wrap up of current industry performance for your category as well as the retail industry as a whole. This is not just your standard financial report, rather, we relate financial performance to valuable consumer trends in the retail sector including cross channel behavior that is absolutely specific to your category. Brian will then transform these trends into the 'how to' of retailing with fitness tips to implement in your business. Current financial statistics from ABS and Citigroup. Brian can link these global and local trends with findings from mystery shopping audits and store visits to bring understanding to your teams of how they fit in the retail landscape. What does it mean to be a cross channel retailer? What cross channel capabilities do the most advanced retailers implement? Who are the world champions of integration? And importantly, how can your retail business learn from these champions to become a fit cross channel retailer? In this session, Brian Walker will use our latest global research to address these questions and provide implementation solutions that are right for your business. How to keep your store looking and feeling fresh every day of the year. Brian Walker will teach your teams how to create an exciting and engaging in store retail experience with tips for visual merchandising and sales success. We will show you how to create a shopping experience that resonates with your customers, what style of customer service to provide as well as some tips on improving your teams selling skills. The plethora of communication channels now available to retailers has created a new retail frontier and way of thinking. This has and will continue to create increased role diversity, changing skill sets and a need for a new retail human resource capability. So what does this mean for the retailer of today? What will the retailer of tomorrow look like? And how will we lead this new diverse team to success? Brian Walker will answer these questions and more in this inspiring, motivating and educational session, giving attendees the tools and understanding to coach a winning team. The first time I saw Brian Walker deliver a keynote speech was at the Microsoft Retail Launch event in March 2009. Brian demonstrated deep knowledge of the subject, enthusiasm and passion and when we were considering sponsoring another event, the fact that Brian was presenting at the event was a deciding factor. Once again, Brian's presentation was engaging, inspiring, thought provoking and delivered with great skill and professionalism. Since then, we have recorded a video interview with Brian and published it on our website, to share his insights with the wider audience. Brian combines both talent, knowledge of his topics with inspiring and motivating delivery and we have no hesitation recommending Brian as a truly "fit" presenter. The Collins Street Precinct Group are a not for profit association funded by the City of Melbourne and decided to book Brian Walker, The Retail Doctor to run the a series of 4 breakfast events based on "being Fit for Business". The response to Brian's presentations has been excellent with our attendees booking for the first breakfast and each breakfast thereafter. Our numbers at the breakfasts have grown to the point that individuals are now booking tables and bringing a lot more of their staff. We would highly recommend Brian Walker, The Retail Doctor as he has certainly assisted many of our attendees to be "fit" in business with a fantastic and interactive presentation given them all something to take back to their businesses and implement. The ODMA association recently engaged the Retail Doctor to participate in our bi-annual trade fair. In particular the Retail Doctor conducted 2 diagnostic workshops where he was able to address and answer optometrists retailing questions with great skill and relevance to their particular issues. The Retail Doctor also conducted a wonderful and highly interactive presentation to the greater conference audience on the highly relevant topic of "future Proofing retail." The Retail Doctor presented at a networking dinner which we hold annyally for our hair and beauty salon customers. The brief was to provide fresh ideas for our customers to implement in improving the retail component of their businesses. The Retail Doctor was able to show the attendees, many of whom are small business owners, how larger retail operations track their business, and some of the key indicators one should look for to improve and safeguard their operations. The evening was a success, and we found the presentation to be most informative and interesting.